SINGAPORE - When it comes to baking almond cookies, Mrs Belinda Foo, 55, is nothing short of meticulous. An exact 6g ball of dough is measured and rolled into a perfect sphere. A drop of egg yellow food colouring is added to the egg wash to ensure a golden sheen. After baking, the cookies would get Mrs Foo's nod of approval only if they have the "correct cracks" along the surface. That obsessive attention to detail comes from a late distant relative, whom she affectionately called Auntie Siew. Mrs Foo, who does operational procurement at a German bank, fondly recalls Auntie Siew holding the highest standards in baking almond cookies. That includes only using whole almonds from California. "Once, I used a different kind of almond and she called to ask why I used the 'wrong almonds'. When she came to teach the recipe to me and my neighbours 10 years ago, she would pick out the balls of dough that were not 'round enough'," says Mrs Foo, who gets her supply of almonds from Teck Sang, a wholesaler of nuts, herbs and dried seafood in Hongkong Street. "She'd even point out who was 'not worthy' of making the almond cookies any more because they did not do it right." 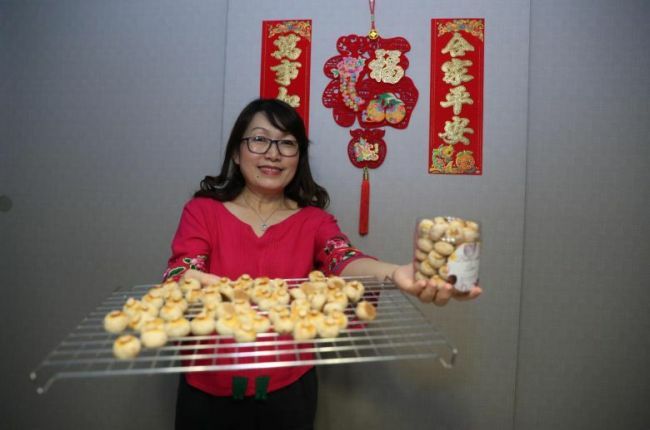 When she was a teenager, these precious almond cookies were what Mrs Foo looked forward to during Chinese New Year, when Auntie Siew would give her family two Ovaltine containers filled with the bite-sized goodies. She says: "The recipe has been with my aunt for at least 50 years and I believe it was also passed down to her. It is thanks to her that I have a good recipe and I bake the cookies to honour her." Mrs Foo - who is married to a Boeing flight instructor with six children - follows the original recipe to a tee, but reduces the sugar level. The blended almonds are meant to have a coarse texture to give more bite to the cookies, but can be blended till fine as well. Vegetarians who want to try the recipe can omit the egg wash used, Mrs Foo suggests. Every batch of dough is kneaded by hand, and while an electric mixer can be used, Mrs Foo is not keen. "It's called handmade for a reason. No shortcuts," she insists. Indeed, there is no compromise when it comes to churning out Chinese New Year goodies by hand for friends and colleagues. Besides almond cookies, Mrs Foo also gathers her 80-year-old mother, one of her sisters and two neighbours to make biscotti, pineapple tarts, and pig- and dog-shaped butter cookies with a chocolate centre. "That's the New Year spirit for me, when we get together to bake. Everyone has their role and we are chatting and having fun," says the second of eight children. The family whips up a feast over the festive period too. Dishes include sio bak (roast pork belly), curry and braised mushroom dishes. On the last day of Chinese New Year, they make choy geok - a traditional dish made with all leftovers and boiled into a soup with chilli, tamarind, garlic and mustard leaf. Mrs Foo's love of cooking stems from her mother, who used to make love letters for Chinese New Year over a charcoal fire. She also cooked dishes like pig stomach soup and made glutinous rice dumplings. Mrs Foo says: "We were trained in making rice dumplings by first learning how to wrap sand instead. If we could do that, then we were allowed to wrap the actual dumplings." While she is passionate about heritage recipes, Mrs Foo is also quite the experimental cook. In 2016, she took a part-time diploma in Baking Arts & Science at the CerealTech School of Baking Technology, where she honed her craft in baking bread and making elaborate tiered cakes with intricate sugar work. She says: "Baking and cooking is also about the learning process and why you do things a certain way. For example, you understand why the temperature of water is very important for making bread. "Over the years, I have got to understand my kitchen equipment better, as well as how the same ingredient from different countries can affect the product. "Most importantly, my mum always says one must be happy when you are cooking or baking. As long as you are happy, even the simplest dish will taste good." 2. Line a baking pan with baking paper. Spread the almonds on the pan and roast in the oven for 10 minutes until fragrant. Check occasionally to ensure the almonds do not burn. 3. Remove the pan from the oven and pour the almonds into a blender. Blend till the almonds have a coarse texture. If you prefer a finer bread crumb texture, blend for a few more minutes. 4. Mix the flour, icing sugar, baking powder, baking soda and salt in a bowl with a spoon. Sift the ingredients into a large bowl. 5. Add the canola oil in small amounts to the dry ingredients, so the dough does not get too wet. Use your hands to mix the ingredients to form a ball of dough. If the dough is too wet, add small amounts of flour. 6. With a kitchen scale, measure 6g of dough and roll it into a ball. Place the ball of dough on a baking pan lined with baking paper. 7. Repeat the process with the rest of the dough, and place the balls out evenly on the pan. You will need five lined baking pans. Alternatively, you can roll out the dough into 4mm-thick sheets and use a cookie cutter to cut out shapes. 8. Break the egg into a small bowl, and beat in the food colouring. Brush the egg wash on top of each ball of dough. Garnish each ball of dough with one sliced almond. 10. Leave the cookies to cool on a wire rack and keep in an air-tight container for up to three months.